Komodo is an Indonesian island home to approximately 2,000 people who are mostly descendants of former convicts once exiled here. 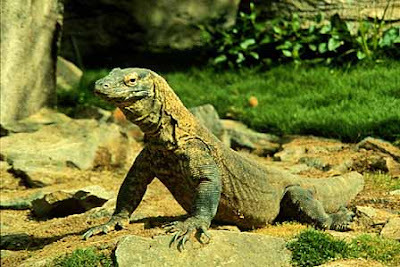 The island is part of Komodo National Park and is especially known for its native Komodo Dragon the world's largest living lizard !!! In 1908, a unit of Netherlands army reported that they saw a dragon looking like a monster in southern island of East Nusa Tenggara Province. Knowing the news, Lieutenant Steyn van Hens Broek, a functional administrator of the Netherlands, wanted to prove it. Then, he prepared a unit of army whose office was in Flores to sail to that island. Having arrived there, Lieutenant Steyn and his crew saw giant lizards which length was up to two meters. Steyn could kill one of those giant lizards and brought it to his office in Ende City. Then, this giant lizard was photographed and the picture was brought to Peter A. Ouwens, a director of Zoological Museum and Botanical Garden in Bogor. This was the first documentation of a giant lizard named Komodo. 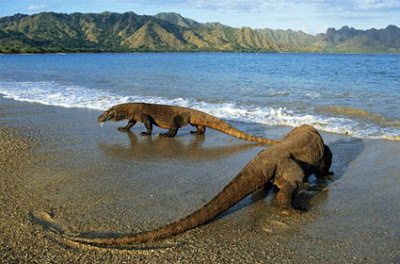 Therefore, in 1910 the Netherlands named the island as Komodo Island. The result of that photography was published by a national daily newspaper of Netherlands in 1912. This publication made Komodo Island visited by the researchers, missionaries, and tourists. Realizing that Komodo was a special rare animal in 1915, the Netherlands government issued a rule about protection to this animal from hunting and killing. As the name, Komodo Island is an which is known as the original of Komodo [Varanus Komodoensis]. The local people calls this animal as Ora. Until present day, Komodo still becomes a pride because it becomes a source of income for local people from the tourists who visit the island. In this island, tourists can see Komodo which is the biggest lizard species around the world, with length of the body up to 3,13 meters and weight up to 165 kilograms. The tourists also can see several activities of this rare animal, such as the Komodo copulate which always happens between May until August; Komodo which is eating deer, goats, and pigs; and see Komodo which is sun-bathing on the road and on the branches of trees in the morning. In 1980 the government made Komodo Island as the Komodo National Park to protect Komodo from extinction. Six years later, in 1986, this national park was accepted as the World Inheritance Site by UNESCO. This national park consists of two big island. They are Rinca Island and Padar Island surrounded by several small islands. The total wide of this national park was 1.817 kilometers square. Komodo Island is an located in the western area of East Nusa Tenggara Province bordered to the West Nusa Tenggara Province. Administratively, this island is included in the Komodo Sub-district, West Manggarai District, East Nusa Tenggara Province, Indonesia. "The local people calls this animal as Ora". How is original name for Komodo Island? Join Awesome Subscribers, Fans And Followers ! Creative Commons Licence | All Rights Reserved.